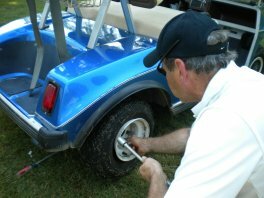 How to change a golf cart tire? With the help of some friends. It was the day before Father's Day and I was golfing with my son-in-law. 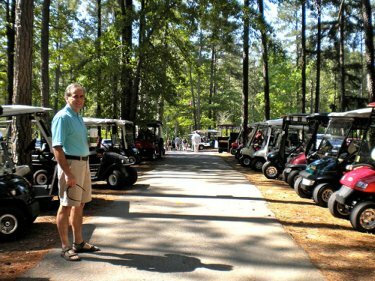 Before we took off golfing with my cart, he made some sarcastic remark, like, "Are you sure you want to use your cart and not mine (just because his is 15 years newer than mine)?" I said of course I'm sure. It was at hole number 2 when the tire went flat. Fortunately, we were close enough to the Club House so that we could run back up to get one of their carts and finish the game. 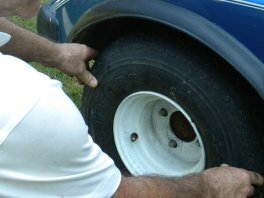 After golfing I went back to replace the golf cart tire. 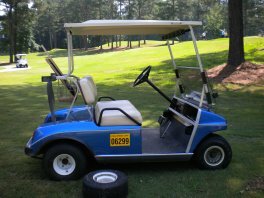 Because I had recently purchased two new golf cart tires I had an old tire in the garage to use as a spare. So why did the golf tire come off the rim? 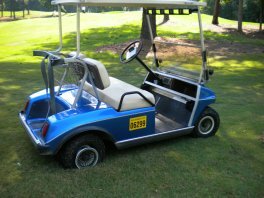 One golfer who came by who owns a golf cart repair shop, said it could be because my tire pressure was low and when I hit an obstacle or curb, the impact pushed the tire off the rim and it went flat. 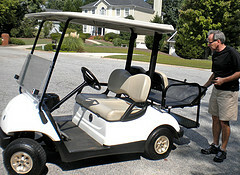 I made sure the golf cart was turned off and the brake was on. As you can see it was fortunately in the shade and on level ground. 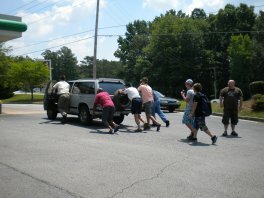 At first I couldn't get the jack up under the rear axle - but a group of golfers came to the rescue and lifted up the golf cart so I could get the jack in near the tire that went flat. 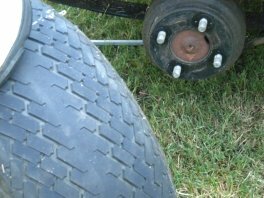 Next I removed the golf cart wheel cover so that I could get to the lug nuts and wheel. 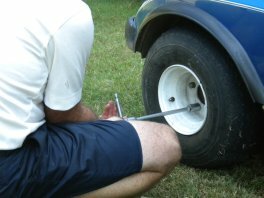 I loosen the lug nuts with a socket and ratchet wrench. But I didn't take them off the tire just yet. Next I went back and raised the golf cart with the jack so that the tire was now barely off the ground as you can see in this picture. Now I removed the lug nuts and then took off the tire. 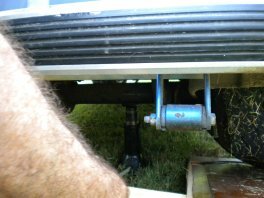 I lowered the jack some - just enough so that there is a little pressure on the golf cart tire - but not too much. 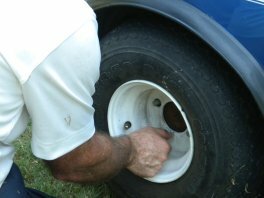 Then I tighten the lug nuts. Next I lowered the jack until all the pressure was not residing on the new tire. Remove the jack. Replace the wheel cover. 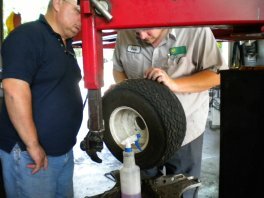 I brought the golf cart tire to the local auto mechanic shop to have it tested for a leak or a hole. First they inspected it and couldn't see any puncture or hole. Then they sprayed it with soap and immersed the tire in a tank of water where they check for bubbles. 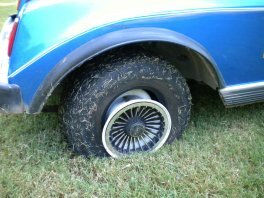 No one can explain it - but there weren't any holes or leaks - so maybe it was just low tire pressure and then the tire popped of the wheel when I went over a curb. 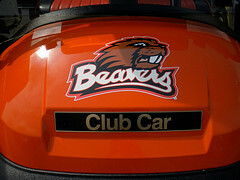 I had a chance to "pay back" the good deed of the golfers lifting my cart. While I was at the auto repair shop testing the tire, a man ran out of gas just yards before entering the gas station. So several of us ran to his rescue and pushed the cart up to the gas tank. 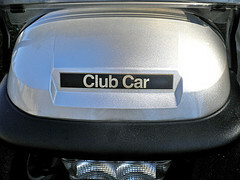 © Copyright 2009 - 2019 Golf-Carts-Etc.com Do Not Copy. No use is permitted without written permission. All rights reserved. This DMCA site is protected under U.S. and International copyright laws. Do Not Copy any Content or Images. No use is permitted without written permission.